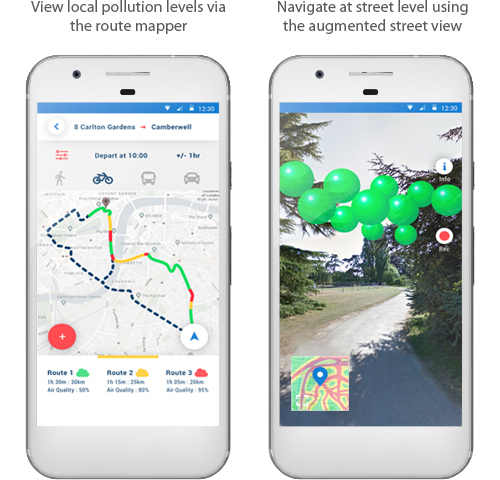 Underpinned by RapidAir® – Ricardo's powerful air quality diagnostics and decision support tool – this state-of-the art pollution exposure app provides individuals with accurate information about their personal exposure to a range of pollutants. Access clear and easy-to-understand air quality information specific to their location. Identify least polluted routes for journeys and the best times to walk, run or cycle. Track personal air pollution exposure over time (day/week). Ricardo's pollution exposure app is currently in the prototype stage, undergoing beta-testing. Testing is focussed on refining functionality and design of the app through in-depth usability research and customisation for specific city contexts. Exposure to outdoor air pollution results in around 40,000 premature deaths in the UK each year and costs the economy £20 billion. Driven by a greater understanding of the potential health impacts, air pollution is a growing priority in cities. This is reflected by increasing media interest and heightened public awareness regarding the dangers of pollution exposure. Environmentally conscious citizens are increasingly looking to public authorities and local bodies to provide guidance and implement measures that protect public health. People need access to clear, reliable, high-resolution data to make better informed decisions about their air pollution exposure. The absence of reliable, up to date, hyper-local air pollution data has proven a significant barrier to empowering citizens with the information necessary to make informed decisions regarding their day-to-day activities. All too often, existing air pollution solutions suffer from common limitations that include inaccurate, low-quality data, and poor spatial and temporal resolution. These result in outputs that don’t reflect an individual’s actual pollution exposure. Ricardo’s solution draws upon the very latest technology and is underpinned by our leading-edge, city-scale, air pollution data modelling capabilities, providing greater accuracy and a higher level of resolution never before possible. Enabling widespread public access to credible air pollution information, underpinned by advanced city-scale pollution modelling. Providing the tools to ‘nudge’ citizens toward healthier choices around where, when and how they travel. Educating the public on the risks of air pollution through instant, tailored, personal air quality information. Driving greater stakeholder engagement on air pollution issues. We welcome support from potential partners, sponsors and technical collaborators to refine the functionality and design of the app through in-depth usability research and customisation for specific city contexts. To register your interest or for more information, please complete the form below.